I seem to have a thing for problem cities. When I was a kid, growing up in Michigan in the 1970s and 80s, the most exciting weekend family plans involved going to Detroit, where my dad was born. Detroit was exciting and fascinating on every level. It was huge, full of things to do, and run down and beautiful all at once. It was, in other words, everything my sweet, safe hometown of 12,000 was not. In Detroit, we went to productions at the Fox Theatre (my favorite performance there was Into the Woods, starring jazz singer Cleo Lane as the witch). We went to Greek Town and ate saganaki—cheese set to flames at our table—while our dad told us stories about growing up in Detroit in the 1950s, when it was a grand city, downtown was bustling, and our grandparents sang in the opera. During winter visits, we went to Redwings hockey games and then tested our skating skills at the outdoor rink on Woodward Avenue, in the heart of downtown. Summers meant watching games at Tiger stadium (where we kept stats and brought our mitts, just in case a foul ball or home run came our way), and playing Crazy Eights on the river boat that took us to Bob-Lo Island, an old-school amusement park on the Canadian side. Nights in Detroit were spent at the home of my great aunt, who was the only white person still living in her middle class neighborhood. She had flatly rejected the idea of white flight. Once back at home in our comfortable mid-Michigan town, our friends (and their parents) were shocked that we went to Detroit and came back alive. No one went to Detroit. People were terrified even of the idea. But I knew better. It was simply misunderstood, which made me love it even more. As an adult, St. Louis became my new favorite misunderstood city. I lived there, in the city proper just south of Forest Park, from 1994-97, and to this day I’m one of its greatest promoters. If I’m not selling the city as a wonderful place to visit, I’m at the very least busy systematically changing people’s negative perceptions. St. Louis is full of beautiful parks and old brick houses, I tell them. It has amazing museums and gardens and a zoo that are almost all free, and it’s full of great ethnic restaurants and live music. The negativity I hear about St. Louis, like Detroit, gets old after a while. Where do these preconceived notions come from? How can people who have never been to a place have such strong impressions of it? This morning as I was Googling St. Louis, just to find out how many people live there, I got an eyeful of bad news. For instance, the city’s population has been shrinking steadily for years, dropping 27 percent in the past decade. It’s now the 52nd largest city in the states, even though it was once the 4th largest. That’s depressing, for sure. On top of that, earlier this year the public schools were deemed so terrible they were stripped of accreditation and taken over by the state. Maybe the negativity also has something to do with the city’s reputation as a danger zone. It’s been among the 10 most dangerous cities in the country for years; in 2006, as I just now learned, it was rated the most dangerous city in the nation (with the occupant of my other soft spot, Detroit, coming in second). Ouch. From a city’s perspective, news doesn’t get worse than that. Whatever my thinking or lack thereof, we took the girls down to St. Louie this past weekend for an idyllic visit. We stayed with my good friends Aaron and Becca, who live with their three kids in a beautiful three-story house on the edge of Tower Grove Park, a 300-acre, 150-year-old park. The older kids got to go to the Harry Potter book release street party in the Central West End, where, at midnight, Havah got her long-awaited copy of the final book. We spent a couple of hours Saturday morning in the 80-acre botanical gardens, which has a rainforest dome and a great kids’ area. 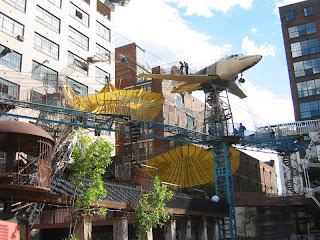 And we went to the City Museum (see photo below), a truly one-of-a-kind place described on its website as: “…an eclectic mixture of children’s playground, funhouse, surrealistic pavilion, and architectural marvel made out of unique, found objects.” We ate delicious Mexican food and the famous Ted Drewe’s frozen custard, played in Tower Grove Park, and the adults sat outside at night talking, drinking wine and smoking (at least some did). Learning about the city’s serious ills right on the tail of such a great weekend was a let down. Maybe I’m naive or I put too much faith in the power of positive thinking, but I can’t bear to believe the reports or to abandon this sad, wonderful place. I want to protect it like I might protect a 13-year-old who’s going through an awkward phase. If only everyone could just bliss their way through the rough patches, without letting a bit of ugly spiral out of control, everything would be fine. But the reality is, a bit of bad luck—for cities and adolescents—tends to snowball, rapidly gaining size and momentum and having devastating effects. It’s the same group think attitude and focus on fear that can cause the stock market to crash, or a new restaurant to never get off the ground, or a middle school kid to be treated like a leper. Sadly, depressed cities are just another overwhelming problem without a clear solution, like poverty and healthcare and war. Can one person (or one family) really “make a difference,” as so many public service campaigns like to suggest? I think about my childhood memories of Detroit, and I can imagine the city smiled for a moment when my family arrived for the weekend, acting like it was a grand tourist attraction, not the subject of a grim news story. And I know our girls will always love St. Louis, dipping again and again into the childhood memory bank they’re building. And as parents? Jason and I will keep taking our family there and to other big cities—not to put them in danger, of course, but to teach them about places different from the ones they know best. Most importantly, I’ll always teach the girls that loving problem cities is not always such a problem—they’re certainly less detrimental than falling for problem men, after all.